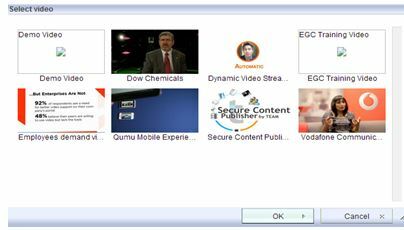 In this demonstration we are going to embed video. You can edit the HTML and add the <iframe> component, but it will be deleted after saving changes or switching between tabs. To avoid this, we customized the task-flow which contains this editor. Next we wanted to have an icon for embedding videos to enhance and simplify the user experience. When a user clicks on the OK button, the video should be added as part of the iframe in the editor. The Tag Library used for this component is rte-taglib.jar, we need change this library. Now to add some content inside of the dialog box and pass some value to the editor, you can check the source of other plugins as help (I used the Colordialog plugin). This was done in WebCenter Portal 11.1.1.8 but is compatible with 11.1.1.7 and 11.1.1.6., as well. If you have any questions, or would like to talk to someone from TEAM, contact us! This entry was posted on Tuesday, February 18th, 2014 at 3:09 pm and is filed under Oracle, Portal, WCM, WebCenter Portal. You can follow any responses to this entry through the RSS 2.0 feed. You can leave a response, or trackback from your own site. Great blog post. The version of CKEditor in WebCenter Portal is not the most recent and it’s hard to upgrade or customize it. But, if you have to, this is the way to go. Although I doubt whether Oracle will support custom changes to the rte-taglib library, and you may run into issues when patching or upgrading as well. Thanks Jaap. Yes, we are aware about possible issues when patching or upgrading but we found this to be the only way to add some custom functionality.